Above, singer Hailee Steinfeld, in a dress painted live by aerosol sprays, 4th November, 2018, at the MTV EMA, in Bilbao and below, model Shalom Harlow in the Alexander McQueen's No. 13 fashion show, in 1998, in London. BACK TO THE FUTURE. 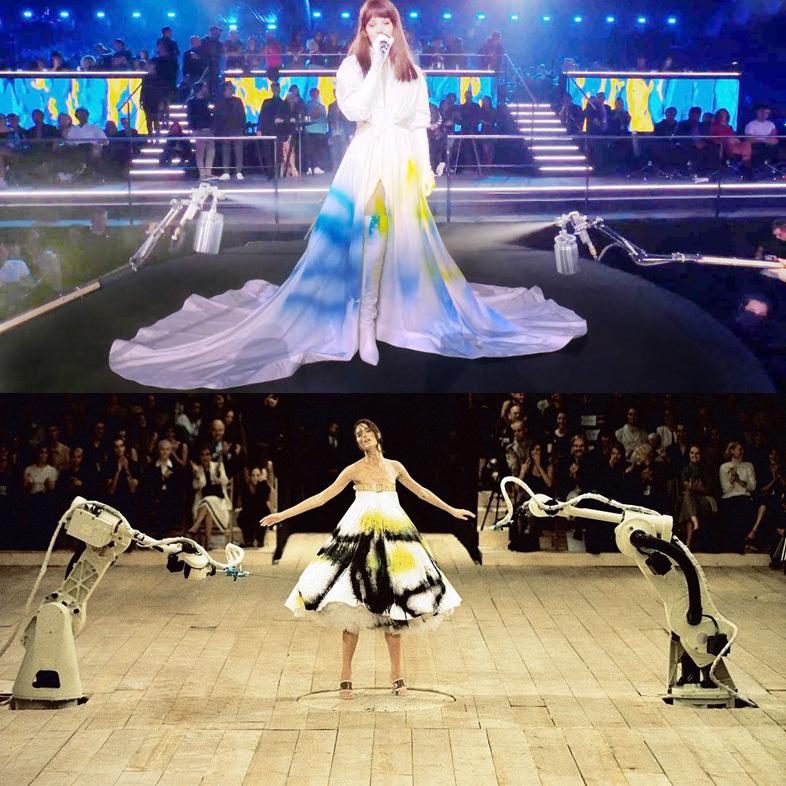 Following the appearance of singer Hailee Steinfeld, in a dress painted live by aerosol sprays, this weekend, at the MTV Europe Music Awards 2018, Le Boudoir Numérique wishes to pay tribute to a moment of fashion tech grace it was obviously inspired from : the finale of Alexander McQueen's No. 13 fashion show, in 1998. Fashion tech never ceases to inspire popular culture. Latest example : this week-end MTV Europe Music Awards ceremony in Bilbao, Spain, hosted by Hailee Steinfeld. At one point of the show, the American actress and singer wore a long white dress, which fabric was sprayed, live, by two aerosol sprays, in yellow and blue paint. Singer Hailee Steinfeld, in a dress painted live by aerosol sprays, 4th November, 2018, at the MTV EMA, in Bilbao. A "performance" that was reminiscent of another, more poetic and a damn good one : the finale of the fashion show N° 13 of the British designer Alexander McQueen, spring/ summer 1999, in London, in 1998. Two painter robots for automobile industrial production chain were the stars of a breathtaking happening, where the model Shalom Harlow was pivoting in front of them, on a turntable, while his white cotton trapeze dress was offered as a receptacle of their colored sprays jets, black and yellow. Model Shalom Harlow in the Alexander McQueen's No. 13 fashion show, in 1998, in London. In the documentary "McQueen" by Ian Bonhôte and Peter Ettedgui, released last June in Great Britain, Alexander McQueen appears, visibly moved, behind the scenes of his fashion show, after which he confided: " The robots looked like they had a mind of their own. I think that’s the first time that I was blown away by my own show. That man and machine thing at the end was… I am still in shock. It’s the first time I’ve cried at my show." A moment of fashion tech grace… and fashion at large. Images of the finale below.